This month Alumni & Community Relations Coordinator Emily McFarland sat down with Lodge Program Manager and WW alum Tim Maguire to learn more about Willingway’s clinically intensive program for men that emphasizes daily recovery and allows residents to gradually become productive members of the community. 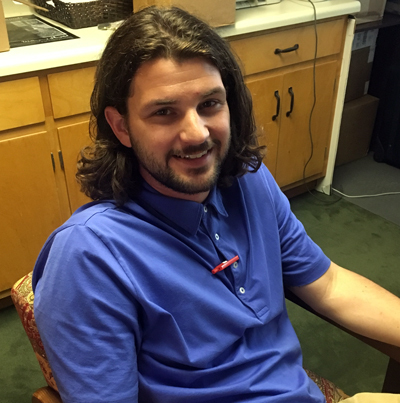 Recently, Tim was promoted to assistant director of Extended Treatment Services, which has given him added duties in addition to running the Men’s Lodge, but anyone who knows Tim will tell you that he’s more than equipped to handle such a workload. Under Tim’s guidance and direction, The Lodge has flourished and a big part of that is because of his dedication to and belief in the effectiveness of long-term treatment. EM: Willingway was founded in 1971 – when did the Men’s Lodge first form? TM: I’m not sure the exact year, but I know that The Lodge has existed for multiple decades. I believe it has been over 30 years. EM: How long have you been managing the program? TM: It’s coming up on two years. I initially began working in Willingway’s maintenance Department and did that for close to a year. When I graduated from long-term treatment, John Williamson came to me and asked if I would work part time as The Lodge House Manager and live in his old apartment on property. John had been the house manager for years before being promoted to the Director of Extended Treatment Services. At first, my new position was simply distributing the residents’ weekly allowances – sort of logistical stuff. Overtime, my duties and responsibilities increased, so that when March of 2017 came around and John Williamson received his promotion, I was asked to come on full time and take on a greater role within The Lodge. At that point, I was working with Jim Becker and his landscaping business mowing grass, in addition to my part-time Lodge duties. I accepted the offer because it was an awesome opportunity. Since then my passion for long-term treatment and its clinical aspects has grown exponentially. EM: Describe the program for us. How is it different from The Lodge that our alumni might be familiar with? TM: The Lodge has actually changed a lot over the years and even some since I was a resident. We currently provide the highest level of clinical services, structure, and accountability that Willingway’s Extended Treatment Services offers males and because of that we can take clients with a higher acuity level. The Lodge, approximately a year long program, has always been pretty high in clinical work since our guys attend outpatient four evenings a week, but now it is even more so, especially since I am available to do one on one sessions as needed. The younger guys request it fairly often, primarily because there are specific issues that 18 to 25 year olds really struggle with in that first year of sobriety – especially the idea of their lives being over and that recovery is just going to be boring and no fun. I am able to help them process and work through those feelings. When I was in the lodge it was a true peer-driven program. John was the program manager but he was also a fulltime inpatient counselor at that time, so for the house to work the residents had to have a certain level of motivation to try to do the right thing and a lot of the responsibilities fell on the senior Lodge residents – people like myself and Nick C. While The Lodge still has a strong peer driven component, the level of staffing has increased. I’m here full time with an office inside the main Lodge and we also have Jose on property nights and weekends. He’s available to do urine drug screens, room and house checks, searches, really whatever needs to be done. Our 3/4 step down house manager also helps out. Plus we have an extended treatment aide, Dirk Graham, who assists both Cornerstone and The Lodge. All of this is in addition to the staff that works with our guys over at Outpatient. EM: That leads me to my next question – what does the ideal Lodge client look like? TM: As I mentioned earlier, now that The Lodge is a higher level of care, we are able to take on more complicated cases. We have become more equipped at effectively handling dual diagnosis and men with behavioral issues. Many of our residents have been to multiple treatments with the inability to remain sober, although that is certainly not a prerequisite. Previously, clients would have some level of motivation and a basic desire to be sober, but now we see more clients that are not motivated – they are more hesitant to find recovery, at least in the beginning. But you can only wear a mask for so long. This is something that is so effective about our program and ties directly into the clinical services and level of staff we offer. When our guys are going to group three hours a night four nights a week with weekly individual counseling sessions, coupled with me being over there all of the time, along with Jose, Adam, and Dirk – it’s only so long until we see through the façade. Additionally, we have Treatment Team multiple times a month, where we discuss the client and the progress he has made, along with any concerning behaviors. A number of staff members are involved in this meeting, so we end up hearing from all these different points of view and are able to collect all of the pieces. It allows us to have as much information as possible so that we can appropriately help our guys become healthy and happy in their recovery. EM: What sets The Lodge apart from other extended treatment programs? TM: Of course there’s the level of clinical work that we do, which we have already discussed, but the family program was actually really big for me when I was in The Lodge. The group is held on Wednesday evenings at Outpatient and works to gradually get the guys back involved with their families. For instance, with me, my family situation was strained to say the least. I had Wednesdays, however, to start out with to rebuild those relationships. Families can come in early and go to lunch with their loved one and spend some time together, followed by group, and then dinner. It’s a slow transition for both sides of the family back into each other’s lives. After they do that a couple times, the family comes to Statesboro for a long weekend, during which they all meet with the counselor on that Friday and then they have the rest of the weekend to spend with their loved one. We really try to get the families involved and do our best to give them as much information as possible, especially about the rules, which exist because of therapeutic reasons. EM: Would you care to share some of what you learned from going through extended treatment at Willingway? TM: The Lodge is where I started connecting with others and began sharing what was really going on with me deep down. I never had experienced that before, at least not on that level. It taught me how to talk to people and how to listen – how to communicate. I also learned that just because I’m in a bad mood, it doesn’t give me the right to treat others poorly. The Lodge showed me how to be there for people. Sometimes the answer is just to listen – it’s not always to have some great advice. I learned that if I don’t put some action into things, I am going to be miserable. For instance, if one sits in treatment and doesn’t do anything to better themselves or their life, they end up just sitting around the house, picking out things to hate. Our solution is gone – the drugs and the alcohol are all long gone – and if I don’t find another solution and put the work in, I will always end up miserable. EM: Completing an extended treatment program, although it is worth it, can be difficult for a variety of reasons. What is something that our clients often find themselves loving about The Lodge? TM: The Lodge guys do quite a bit of fundraising in order to go on trips and experience fun in sobriety. Once they raise enough money, the residents all get together and vote on how they are going to use the funds. The self-esteem and solidarity you feel from doing that is incredible. Working towards something and being able to say “we did this together” and then actually going and experiencing the thing together and feeling the satisfaction of delayed gratification – there’s nothing like it. We recently went to Hilton Head and rented an enormous house for 19 people – right on the beach. And the guys did it all on their own, they raised the money, did the planning. They actually remodeled an entire house to finance that trip! We had five days right on the beach and those kinds of moments are, looking back, the coolest ones to me. It was so much fun, being sober and in the moment, feeling a sense of accomplishment and togetherness. We don’t have to be miserable, that’s not what sobriety is about. To find out more about services offered by Willingway inpatient treatment in Georgia contact us 24 hours a day at 888-979-2140, and let us help you get started on the road to recovery.